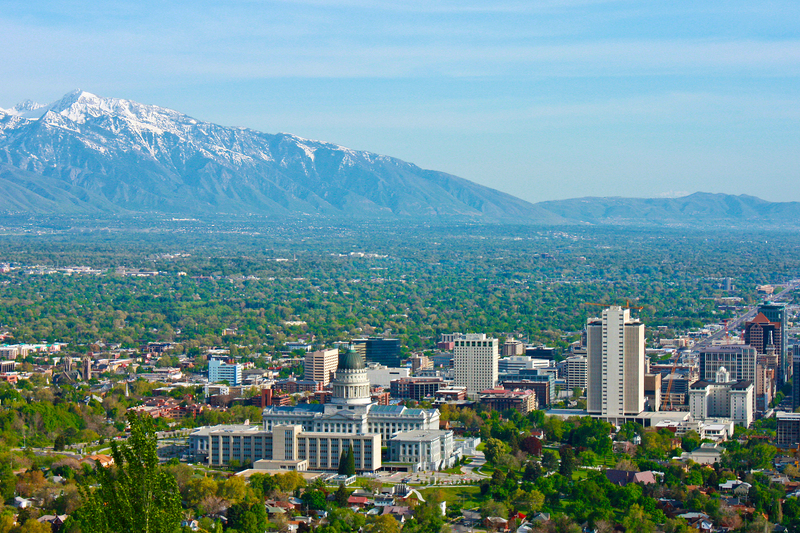 The Salt Lake City area in Utah has plenty to offer Baby Boomers looking to retire. The Salt Lake City Area has attracted active adults over the years because of its beautiful scenery and cultural attractions as well as its outdoor environment that provides endless options for recreational activities. Retirees can stay active by hiking, skiing, biking, climbing, or camping along breathtaking mountains, canyons, and rivers. And with the Great Salt Lake nearby, retirees have even more opportunities for boating and other water activities while enjoying some outdoor adventure. Not only does this area have great outdoor recreation and natural beauty but it also has a variety of active adult communities that cater to the Baby Boomer lifestyle. The Salt Lake City Area is made up of popular cities like Salt Lake City, South Jordan, Sandy, Lehi, West Jordan, Syracuse, Highland, Payson, West Valley City, and American Fork, just to name a few. The area is also surrounded with vast open spaces, national parks, cultural attractions, big-city entertainment, and world-class ski resorts. The region’s scenic landscapes, vibrant arts and culture scene, and a varied climate make the Salt Lake City area an attractive retirement destination for active adults. The region experiences all four seasons, which is ideal for retirees who seek varying climates throughout their Golden Years. Spring and summers are typically warm with average temperatures in the high 50s to 70s during spring and up to the high 80s during summer. Warm temperatures in the valley combined with snow on the mountain tops make it possible for people to comfortably ski and golf on the same day. Fall and winter seasons experience more snow and freezing temps although the temperatures rarely fall below zero. Winter in the Salt Lake City Area means retirees have the perfect opportunity to ski, snowboard, or snowshoe at some of the best ski resorts or in nearby canyons. Retirees are never too far from something fun to do while living here. Outdoor adventurers can explore nearby national parks such as East Canyon State Park, Antelope Island State Park, or Great Salt Lake Marina. Boomers who want some indoor entertainment can check out the Utah Museum of Fine Arts, Natural History Museum of Utah, The Beehive House, or Capitol Theatre. There are also plenty of music and performance venues throughout the area for a vibrant nightlife. History buffs will also love visiting Temple Square, Salt Lake City’s most popular attraction and home of the Church of Jesus Christ of Latter-day Saints, which displays incredible architectural exteriors made of quartz monzonite blocks. And with an average of 500 annual inches of dry, powder-like snow, retirees can explore all of the ski spots that offer everything from gentle slopes to challenging hills, with a majority of them located one hour from Salt Lake City International Airport. Those who prefer to explore the area’s wilder side can whitewater raft along the region’s beautiful canyons in popular spots like Green River, which can be reached from various national parks like Capitol Reef National Park, Arches National Park, or Canyonlands National Park. This exciting area in Northern Utah combines the amenities of a major metro urban environment with the welcoming and tranquil vibe of a charming mountain setting. Retirees will find a wide selection of active adult communities that offer new construction to quality resale homes at reasonable prices. Some of the established 55+ communities found in the area include Bridlewood Villas in West Jordan, Alta View Estates in Sandy, Sunset Park Villages in Syracuse, and Brookhaven Villas in Lehi. These charming active adult communities offer homebuyers affordable homes priced under $400k and feature well-appointed amenities and a friendly social atmosphere. Active adults looking for new construction will also find that and much more in communities like Garden Park at Daybreak in South Jordan, Stirling Pointe at Skye Estates in Highland, Harvest Villas in South Jordan, Heritage Village in Payson, and The Village at Bingham Point in West Valley. Retirees will find homes priced from the low $200s to mid $500s as well as resort-style amenities like beautiful clubhouses, game rooms, exercise rooms, outdoor pools, community gardens, multiple sports courts, walking and biking trails, and parks and natural space. Homeowners living in these maintenance-free communities also enjoy all of the activities and clubs that allow neighbors to mingle and become fast friends. From holiday events and movie nights to potluck dinners and card games, there is something for everyone at each of these 55-plus communities. With a beautiful outdoor paradise and great cultural attractions and entertainment combined with attractive age-restricted communities situated throughout this prime location in Northern Utah, it’s no surprise to see more retirees flock to the Salt Lake City Area to fulfill their retirement dreams.